D&H will be headquartered in this building in Lower Paxton Township. One of the region’s largest companies is moving out of Harrisburg, as D&H Distributing has purchased a 50-acre parcel of land in the nearby suburbs. 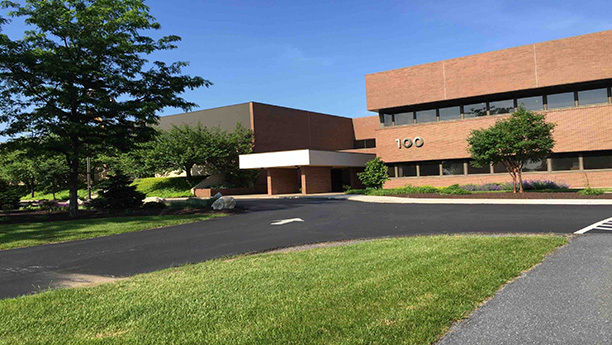 D&H expects to make the move later this year, relocating from its longtime Harrisburg headquarters to 100 and 200 Amp Dr. in Lower Paxton Township, near I-81, according to the company. Co-President Dan Schwab said that a need for more space led to the move. With 244,512 square feet of office space between two main buildings, the new headquarters will be about twice as large as the current location on the 2500-block of N. 7th Street in Harrisburg, he said. “The AMP Drive campus provides adequate space for continued expansion, future-proofing the D&H corporate headquarters for decades to come,” he said. The new office will offer the company other amenities, such as easy highway access, a larger cafe, a full-service cafeteria, a state-of-the-art data center and a 900-space parking lot, according to D&H. D&H bought the property for $8.2 million from TE Connectivity Corp., which will continue to occupy a portion of the campus. D&H will either sell or lease its current Harrisburg headquarters, Schwab said. Founded in Williamsport as Economy Tire and Rubber, D&H last year marked its 100th anniversary. Over the years, it evolved from a tire seller to become one of the country’s largest distributors of IT and electronics. It’s been at its current Harrisburg address since 1952. Last year, Forbes magazine ranked D&H as No. 109 among the largest private companies in the United States. The company stated that it expects to add 30 jobs just this year. This story has been updated to include additional information and comments from D&H Distributing. Previous Post TheBurg Podcast: "So Long For Now." Next Post A Special Space: African-American businesses, artists find support at La Cultura.